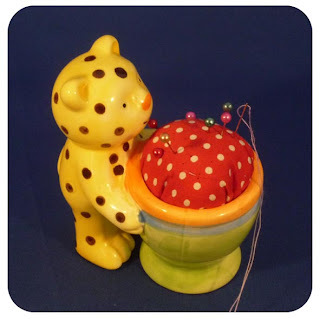 I am not a big pin user and I have a cute little hedgehog pin cushion, that I like a lot BUT it is too light and forever falling on the floor when I am working on the sewing machine. So I decided I needed one with a heavier base. After spotting a antique pin cushion in a ceramic pot, the pot was a little donkey and the cushion his 'load', can't for the life of me remember where I saw it, anyway I decided to make my own. Having no antique or vintage pots lying around the house, I decided to ferret through the kitchen draws and I found this egg cup! A bit of tinkering and voila, my new pin cushion. I did put dried coffee grounds in as filling to keep the pins sharp but I have noticed it had discoloured the fabric, smells good though. 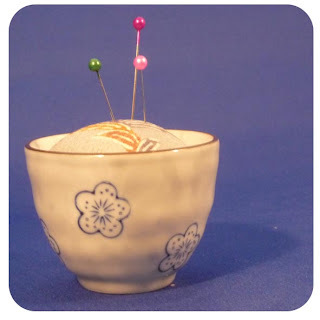 Then I started looking round for other small objects, I ended up making 5 more little pin cushions, I think this one is my favourite, it is a sake cup and the fabric is a piece of kimono from a damaged kimono that my SIL sent me (one of her grandmothers kimono's, she was a kimono tailor). I also got to play with my new toy, well birthday present, a light tent Yeah! This is the first time I have had it out, although Hide did lend me his before I got this. 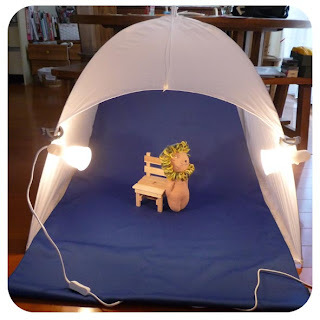 I have decided that my lights are not really powerful enough, there were just ¥99 from Ikea, they worked well with the tiny lightbox I made. The pin cushions are now available in the shop, I have just noticed that when I get the urge to make new things I do it in batches of five, there were 5 sock monkeys, 5 waffle-snorts, 5 little bags and now 5 pin cushions, how odd! Gorgeous, these look fab, have a happy 2010.